Bad color choice for lens barrel, excellent overall. 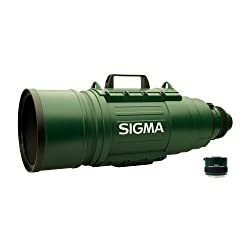 Sigma 200-500mm f/2.8 APO EX DG Ultra-Telephoto Zoom Lens for Canon DSLR Cameras After carefully reading all the reviews for this product and scoffing at the poor chap who wanted to use it as a laser, I sold my left kidney, my house, and my immortal soul to scrape up the money for this lens. Boy, am I glad I did.